I have probably views 1,000 Census Images over the past two weeks and that doesn’t include the 2,300 images that I have looked at in the Indexing Project. I have been cleaning up my Census records working my way back through my file. This evening I was looking at the 1900 Census for Waltham, Middlesex County, Massachusetts. I have seen the record in 2008, when I found my grandmother listed in that record. BUT, I didn’t really LOOK at it. I captured the data, but didn’t really look at the Census Record. The head of the household is Rachel Carroll Allen, my great, great grandmother, along with my grandmother. She would have 13 at the time. What I missed was the 3rd person in the household. A Lodger, Bessie C Stanley. Ms. Stanley worked at the Waltham watch factory, according to her occupation. Why is Rachel’s parents not listed? Well, Rachel’s mother had died in 1893, and her father was killed in 1896. Both worked at that same watch factory. So, who is this Ms. Stanley? Lack of experience on the machine was partly responsible for his fall. A sad accident occurred on High street yesterday afternoon by which Herbert Johnston, a well known employee at the American Watch factory, lost his life. Mr. Johnston was a novice at the art of cycling, and had engaged a wheel for this week to learn to ride. Yesterday morning at about 11:30 he was riding along High street below the Comet Factory. A horse belonging to F.E. Stanley, proprietor of the Stanley Dry Plate Company, and driven by his hired man, was coming along the road from Newton, when it became unmanageable and ran away, throwing the driver out. The horse ran wildly up High Street and coming behind Mr. Johnston, who was unable to avoid it, threw him from his wheel, and he was struck in the head by the horse’s hoof. Mr. Johnston was picked up and carried to the Waltham Hospital, where he died about one o’clock. His remains were immediately turned over to Undertaker Goodnow, and the medical examiner summoned. Dr. Meade examined the remains, and pronounced the death to be caused by a fracture of the skull, causing concussion of the brain..
Mr. Johnston who is a widower lived at 112 Myrtle street with his child and his mother. He was a member of Waltham Lodge A. O. U. W. All members of the Order are urgently requested to meat at A.O.U.W. hall Saturday at 2:15 p. m. to attend the funeral of our late brother H. J. Johnston. Wear dark clothes and white gloves. A. H. Rand, Recorder. I think the Bessie C Stanley, may be a sibling or the Stanley brothers. I don’t know this for sure, but from what I have been able to determine, the Stanley’s took care of my grandmother following this unfortunate accident. This article mentions the same house that is reflected in the 1900 Census. This is that house. 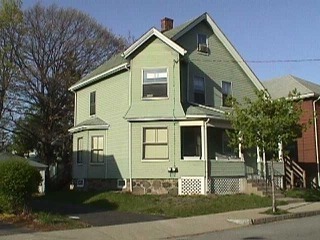 Unfortunately, when I took my parents to see the house in 2003, it was gone. In a couple of days, we will be traveling into New England to meet up with some Genea—Bloggers. This past April, I decided to visit a Genealogy Conference and decided to visit the New England Regional Genealogy Conference in Springfield, MA. I met up with some Facebook and Genea-Bloggers for the first time and walked away with many more. The Genea-Blogging community is always talking about how the “west coast” has these gatherings and the reports in Blogs, Twitter, and Facebook all sound like they are having a wonderful time. A group of New England Bloggers will gather this weekend for a Bash. To say “can’t wait” is an understatement. Just to be able to sit down, face to face to chat will be wonderful. As Patti and I are preparing for this trip (a first for her), Patti has been gathering the information she needs to join the Mayflower Society. She should have an opportunity to chat with other Mayflower Society members with hopes that she will be encouraged to continue with the “paper work” involved with that effort. The drive will be between 5 and 6 hours, so now that we have made the drive, what do we do. Just come home, or make a vacation out of it. It’s funny, two retired people and a vacation. A new concept for me. Aren’t we already on vacation? The choices were Maine or Cape Cod. I have ancestors from Maine, and Patti from New England and Cape Cod. As they say “six of one, a dozen of another”. Earlier in my research, I had met up with a gentleman who was the grandson of a place I had been researching. Through Facebook, I had made “friends” with a couple of folks with the same Surname. They were from Maine, and this gentleman said he had living relatives in Maine. I was reminded of that, so I reached out to that FB friend, only to find out that I was not the first person who tried to make the connection between this gentleman and this FB friend. Not a connection. HOWEVER, in a response, this Facebook friend sent me a ‘hint’ of a museum, in Maine, with the her Surname. Checking that museum out, online, I found that it was located at the Acadia National Park. That just happened to be the destination, for us, when / if we went to Maine. My maternal Grandmother had deep roots in that area, my family growing up would visit there in the summer, and my grandparents went there every summer to spend the summer. A couple of years ago, we visited my grandmother’s “hang outs”. 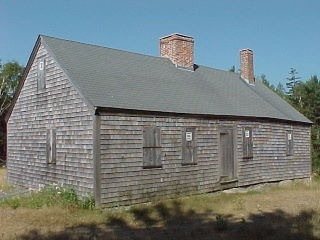 One of which was the Carroll Homestead at Acadia National Park. Getting more information about the Museum, I had emailed the National Park Service, through the website, for the Museum and was forwarded to the Ranger in charge of programs for the Museum. In the email from the Ranger, it turns out that the Carroll Homestead is open on Tuesday’s and a descendent of John Carroll is part of the Open House to “tell stories” about the family. With any luck, on Tuesday, I will meet a cousin to hear stories about our ancestors and to walk into the past, in the home of my 3rd Great-Grandfather. With any luck, and a good internet connection, I’ll be able to blog about this “Great Adventure” and this Walk into the Past. Saturday Night Fun – Who’s Number 21? Hey, it’s Saturday Night, let’s have some fun figuring out who is Number 21 in your ancestry from your memory or your genealogy database. A little late for Saturday night, I am posting my Number 21. The individual with the #21 will be one of our eight second-great-grandmothers. Randy further challenged us to name our eight second-great-grandmothers. Edith Sharpless, daughter of Jesse and Ann (Harvey) Sharpless, was born 1 mo. 15, 1815 and died in Thornbury Twp. on 2 mo. 21, 1900. In Westtown Twp. on 12 mo. 3, 1835 she married Joseph R. Cheyney, son of Curtis and Ann (Reed) Cheyney. He was born in Thornbury Twp., Delaware Co., Pa on 9 mo. 6, 1808 and died there 10 mo. 27, 1878. Mr Cheyney farmed the homestead of his father in Thornbury. Jesse Sharpless married Ellen Roberts Moore. Edwin born 9 mo. 4, 1841 and died 12 mo. 23, 1855. Kersey born 7 mo. 22, 1844 and died 8 mo. 21, 1856. Wilmer married Ellen Harrison James.